What happens after you get rid of the pool table that was taking up space in your basement? Well, if you're the crafty sort, you throw a party! 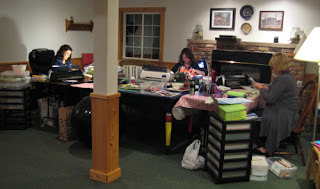 I invited a couple of my scrapbooking friends over for a mini retreat as a warm up for the Western WA Scrapbooking Retreat this November. I'm not a scrapbooker, but I love paper, glue, and all those doo-dads that go with the biz. I opted to work on a project for the Cloth Paper Scissors contest called, "All Buttoned Up." 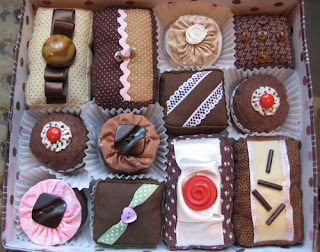 I had sewn some fabric confections, sprinkled with buttons and lace, as a gift for my toddlers back in February. I thought this would make a great contest entry for the use of buttons...and decided to polish up the project by working on the container. I used matte gel medium to adhere strips of paper, sponged on a coat of brown acrylic paint, adhered the "Deux Pois Bakery" logo with dye cut circles and gold paint dots. 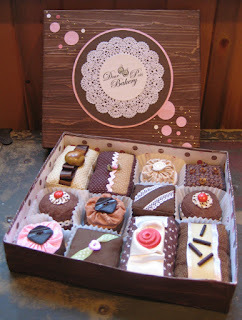 I repeated the pattern inside the box, by lining it with brown, pink, and cream polka dotted paper. 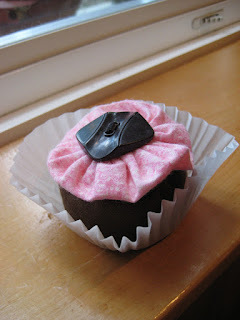 I looked at your drawing & cooking project as well as the baked goods. I can see why you are in the top ones to win. Both are great. Good luck to you in the finals.